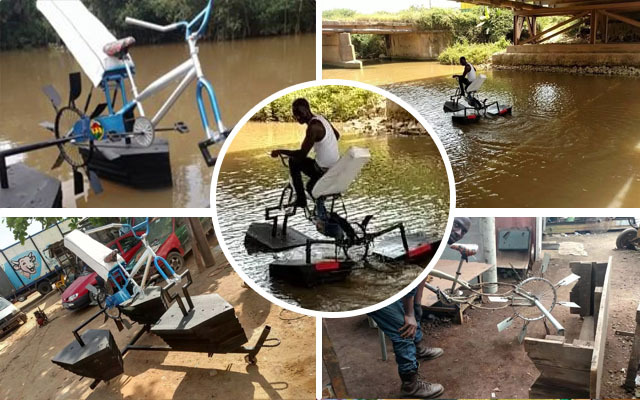 Many Ghanaians are creating and building amazing stuff with their creativity to meet various needs in their society. One of such inventors is Frank Darko. He resides in Takoradi in the Western Region. Frank revealed that he was a final year student at the Takoradi Technical University formerly known as Takoradi Polytechnic pursing a course in Graphic Design. He however added that in his final year of his Higher National Diploma in school, he deferred the course due to some personal reasons. The young inventor revealed that the special bicycle is his first invention and it was built in four months as he started working on it since August this year. Frank Darko reached out to YEN.com.gh and shared his amazing story and remarkable invention with us. According to Frank, the bicycle that was built to move on water was just one of the many things he hopes to build in future.